It’s finally been released after a short delay and Super 7’s ‘ALIEN’ themed ReAction figure carry case is now available for purchase and what a treat it is. From the outset, though, let’s get the most basic disappointment regarding this item out of the way before we proceed into the bulk of the review. 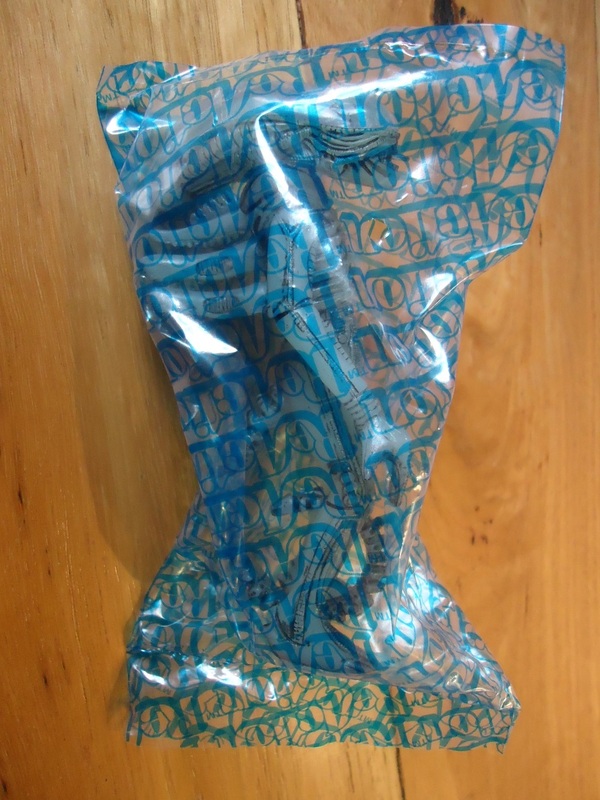 In terms of packaging, Super 7’s ReAction figure carry case has nothing of value to offer. It arrived on my doorstep inside a mailer box. Once opened, the contents revealed little more than the carry case itself wrapped in a plastic bag adorned with nothing more than a suffocation warning. There’s no attractive packaging to aid in presentation here. The plastic wrap bag was sticky taped closed on it’s accessible end and there you have it, that’s all there is. It may disappoint fans of boxes and packaging for presentation purposes so don’t expect anything in this regard. From this initial disappointing standpoint, however, everything improves dramatically and Super 7 fully delivers on their promise on this item. The carry case itself is a marvel! Appropriately taking it’s design cues from the old 1978 Kenner Products ‘Star Wars’ 3 3/4 inch action figure carry case, Super 7 has replicated a wonderful accessory item to complement their well established ‘ALIEN’ ReAction figures line. Many of the features present in the new carry case accessory emulate the familiar older item almost to a fault. 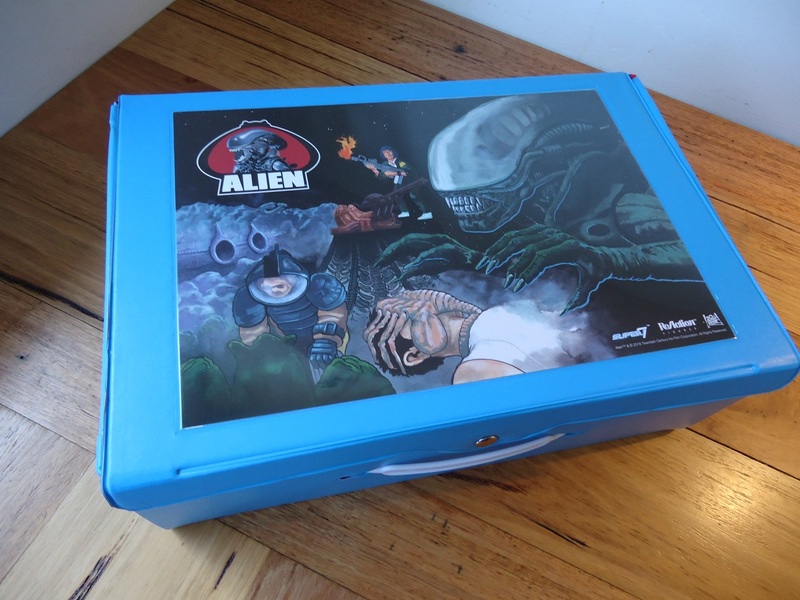 The blue case is made of soft vinyl and features a piece of retro art accompanied by the classic 1979 Kenner Products ‘ALIEN’ product line logo inserted into a sealed clear vinyl window on top of the case. The stylised art is terrific and captures essential elements of the movie in colours and a composition that excellently mimics what Kenner would have produced in 1979 had they made an item such as this available. Aside from the artwork present upon the top, no other art, logos or graphics adorn the case. For all intents and purposes, the carry case is designed to store and protect your ‘ALIEN’ ReAction figures with ease of access. The soft vinyl case has a footprint of 15 x 10 inches and a height of almost 6 inches tall which makes it a reasonably sized item to have on display. Opening the case is a simple process. Lying it down and the pulling at the single press stud clip will unfasten and release the top from the front. The top will fold up and away at the back of the case and the front with the handle will then fold down to fully reveal its contents. It’s a classic arrangement from a long gone era in toy accessory design replicated here with perfection. 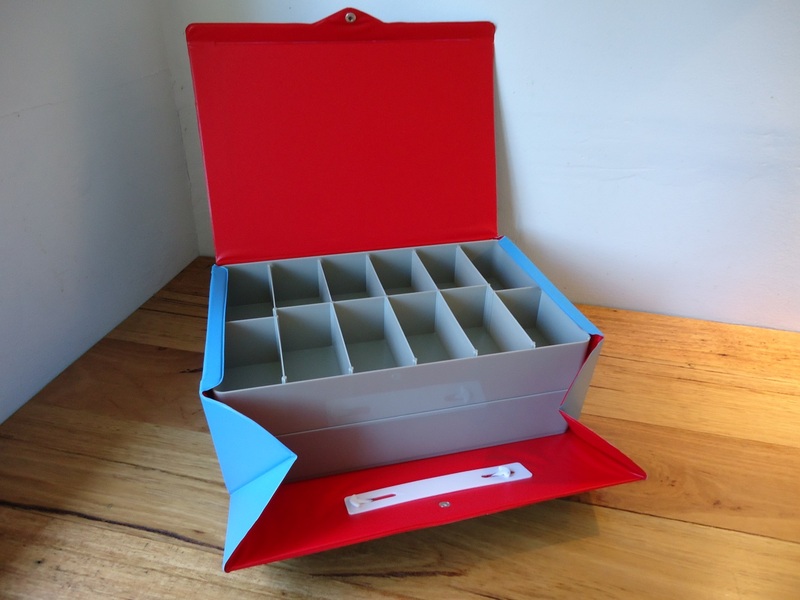 Once the bright blue case is opened, you will be presented with the red vinyl interior from which both storage trays are easily removed. The colour scheme is perfect and the replication of classic vintage design is impeccable. I’ll discuss this in more detail below. 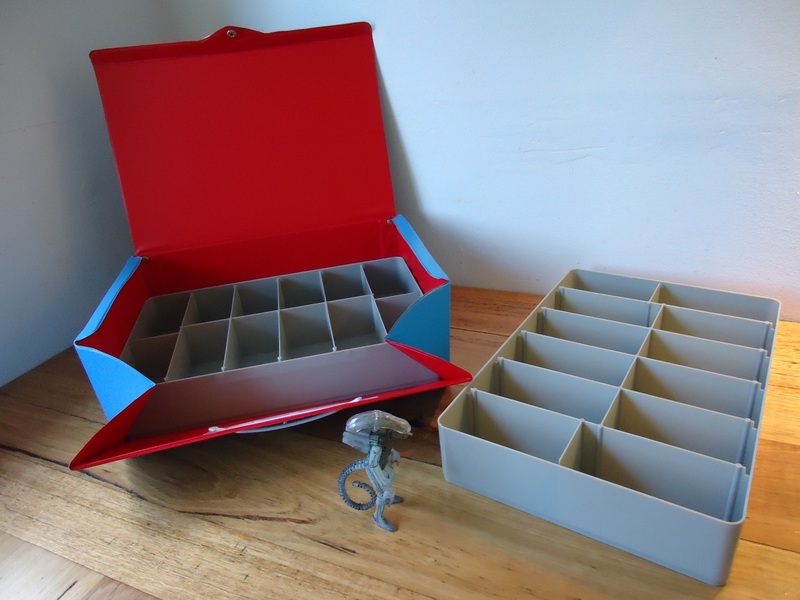 To accommodate your collection of loose figures, the pair of grey PVC trays provides space for at least 2 dozen of them. This is ample room for the most casual collector. The compartment partitioning is set up in pairs with an offset on the central partition allowing for figures of different heights to fit into each tray and Aliens will need to take advantage of additional space provided by this arrangement. 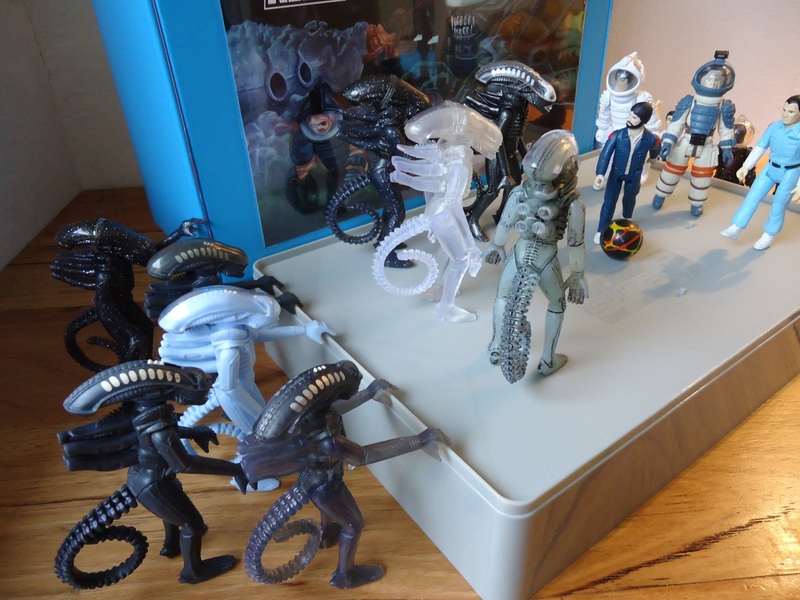 While only 10 ‘ALIEN’ ReAction figures were released, multiple variants and derivations were made available by Super 7 throughout the marketing and continued release of this popular line. These variants and derivations will push that number from 10 to 24, filling your case if you have all those figures loose and dedicate a single figure to each compartment. I’ve added a checklist of variants and derivations below to help you understand how Super 7 have creatively exploited this line to maximum effect. 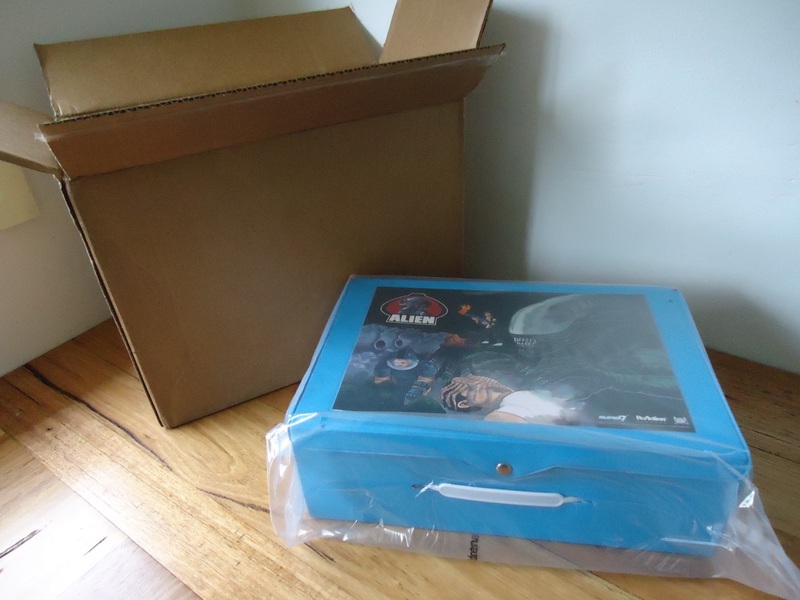 As an added bonus, you will find the case already possesses its first resident. Upon its arrival you will find a unique Little Chap Alien ReAction figure is included in the purchase and it is exclusively available to this case. 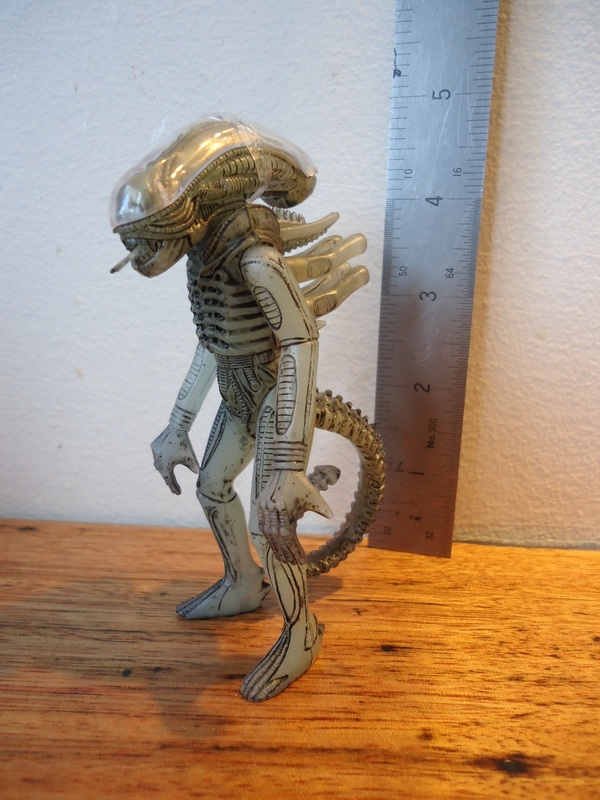 Once again, Super 7 have re-issued the Alien figure and this iteration of it is a glow in the dark variety. It is the same pressing of the figure we have seen previously on multiple occasions and this new addition brings the total number of ReAction figure Little Chap variations to 7. The figure is cast in translucent plastic and given a wash in black paint that amply highlights the figure’s details. 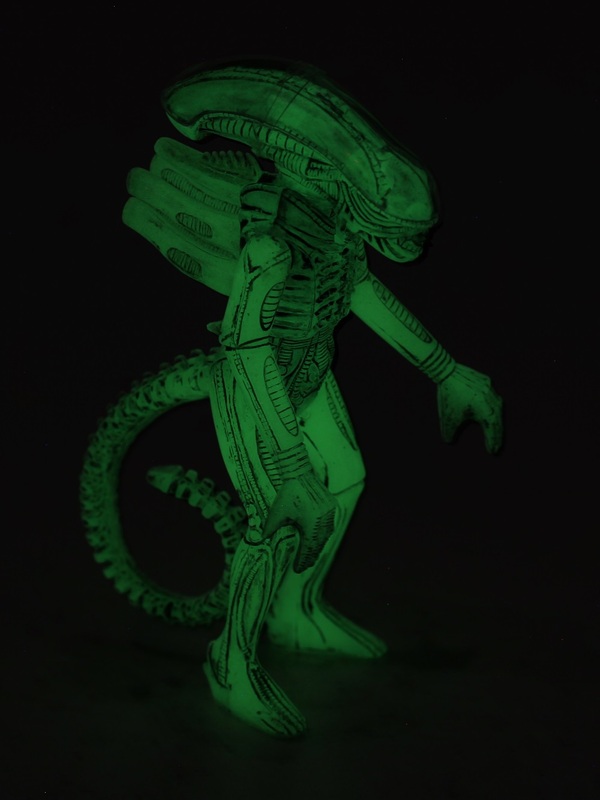 Once removed from his modest plastic baggy and exposed to bright light, the figure will glow green in the dark which will further emphasise the details upon its surface. The glow in the dark iteration is such a great treatment of the Little Chap and I hope that he becomes more readily available in a mass market edition sometime in the future. If Super 7 Were to mass market this item you wouldn’t need to remove the Little Chap from his blister packaged card to get it to glow in the dark. Just shine a light on it and it will do so. Super 7 must do this, I declare, make the glow in the dark Alien available to mass market audience! …but I digress. Back to the case in hand. Pun intend. Groans assured. Returning our attention to the trays, you can easily fit multiple slimmer character figures – notably Ripley, Ash, Dallas and both infected versions of Kane – into a single compartment thus conserving space if you need to. At a pinch you can squeeze 2 Aliens into an individual larger compartment space. As the trays are designed to hold these 3 3/4 inch figures, most of the Super 7’s extant range of ReAction figure line will also fit comfortably into the case with ease. So if you have any loose ‘Big Trouble in Little China’, ‘Breaking Bad’, ‘Predator’ or any number of other ReAction figures just lying around the place, you can stow these little treasures in there as well. All of a sudden, those 24 spaces can potentially fill up mighty quickly. The same can also be said for any of the older Kenner Products ‘Star Wars’ figures from the late 1970’s and 1980’s. Being in the 3 to 4 inch range, this is an ideal place to stow those old action figures, too. This also applies to just about anything small enough that you may want stored. You’ll find it’s handy for small toys, loose change, half a packet of jelly beans, nuts & bolts and just about anything else. If you really want to impress the girls in your life then keep a few condoms in there as well. There’s no reason to limit the use of the carry case to just Super 7’s range of ReAction figures. Inverting the trays will reveal small pegs on their undersides. These nubs can be used to fit into the holes found on the soles of all the ReAction figures feet and secure them in place. This will effectively transform the tray into a display stand just by turning it upside down. As a grey and featureless display stand, it’s kind of drab and ugly but as a small feature in its own right it’s still welcome as an option and adds another level of versatility to the whole package should you choose to use it. 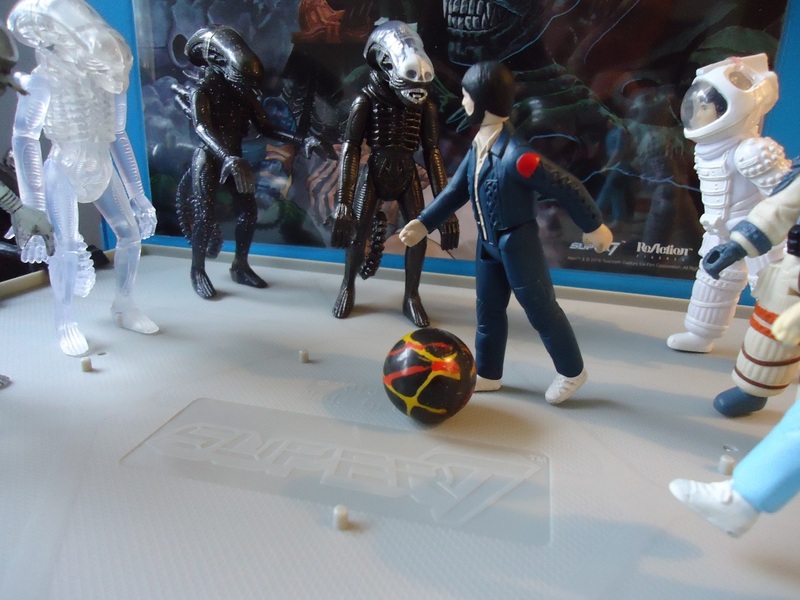 I did have a lot of fun setting up a ‘Team Alien vs. Team Nostromo’ football match on this inverted surface so it can be a fun feature if you are similarly creatively inclined. I mentioned above that the colour scheme is perfect and in regards to its application here it certainly is an excellent choice. You can display the carry case along with Super 7’s other previous products in this line with complete harmony in terms of presentation. It will look particularly appropriate when displayed alongside the blue packaged versions of the Egg Chamber play set and blue carded pre-order versions of the ReAction figures along with the recent nostromo crew 3 pack. All of these items share a familiar design concept and language that fully extends to the new carry case. 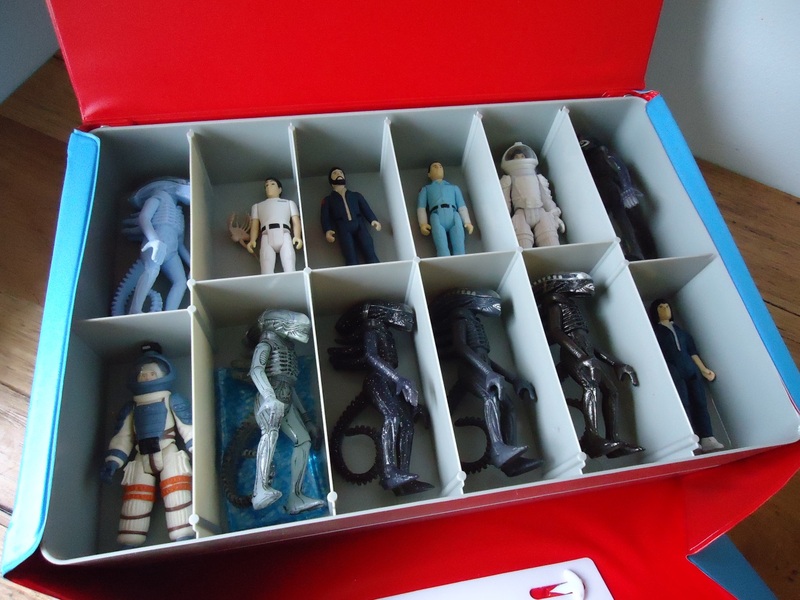 Despite being 3 decades older, even a boxed version of the original Kenner Products Alien figure fits in perfectly alongside the carry case. The red interior of the case was also excellently considered and applied for maximum compatibility. It all serves to demonstrate how wonderful Super 7’s consistent attention to vintage design and detail has been employed with their releases throughout this range. In this regard, the appearance of the carry case couldn’t possibly enjoy any better design or presentation choices as it complements these other items perfectly. 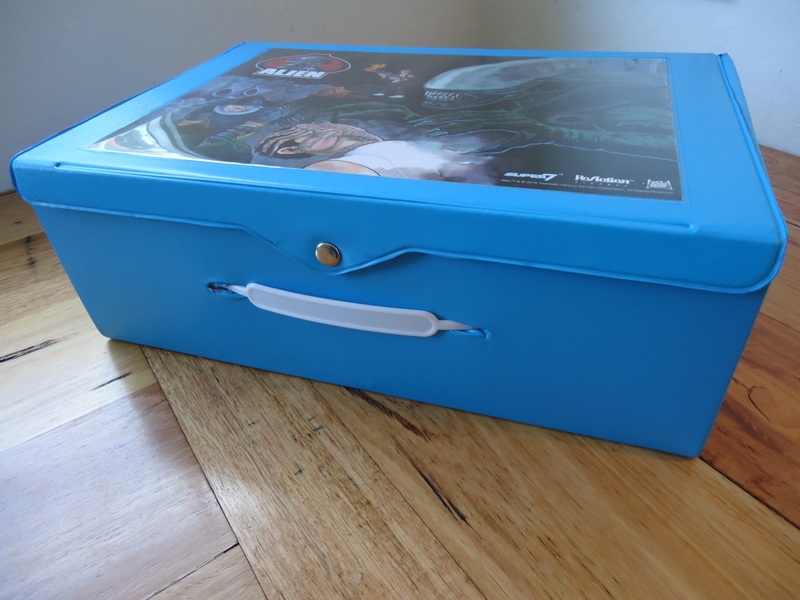 While the case is designed to mimic similar items Kenner made in the late 1970s and early 1980’s, it will not accommodate Kenner’s action figures manufactured during the 1990’s. They are just too large to fit inside the compartments designed to fit smaller figures. If you are considering purchasing the carry case with this intention in mind then you will be disappointed as the carry case is not designed to accommodate Kenner’s range of figures of that period. This is an absolutely terrific item that harkens a design legacy all the way back to a long gone Classic Age in movie tie-in toy history. It has fan service stamped all over it but it’s the kind of service that’s welcome without the cringe worthiness that such fan service can often bring with it. The included glow in the dark Little Chap Alien figure is a delight, too, and it’s an irony this little fellow will spend much of his time inside the darkness of a box where no one will appreciate him. So, liberate your Little Chap! Set him free. The only discernible fault with the entire item is a lack of presentation packaging. You will not find any noteworthy packaging of any type here. It’s the only reason this item lacks a top review score otherwise it delivers everything as anticipated. A near perfect item suitable for collector fans wanting something that shares equal levels of freshness and nostalgia. The ReAction ‘ALIEN’ carry case is not a convention exclusive and is available now. You can purchase it directly from Super 7’s online store. Mine was shipped to Australia and arrived within a week of its release. If you want one of these things but live internationally and maybe concerned about it being available to you, I say go for it! Super 7’s service has been excellent with this item. 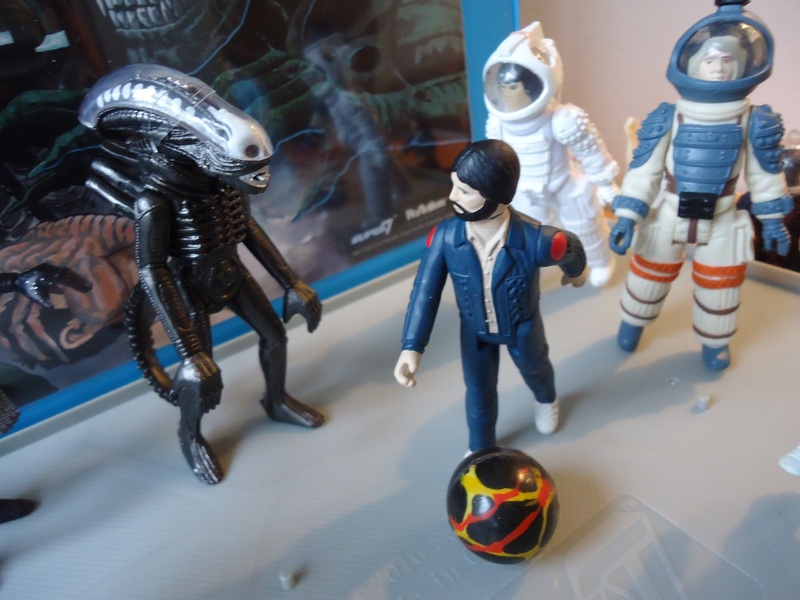 2013 – Faux 1979 prototype promotional: Alien, Kane in compression suit (Light blue pressings.). 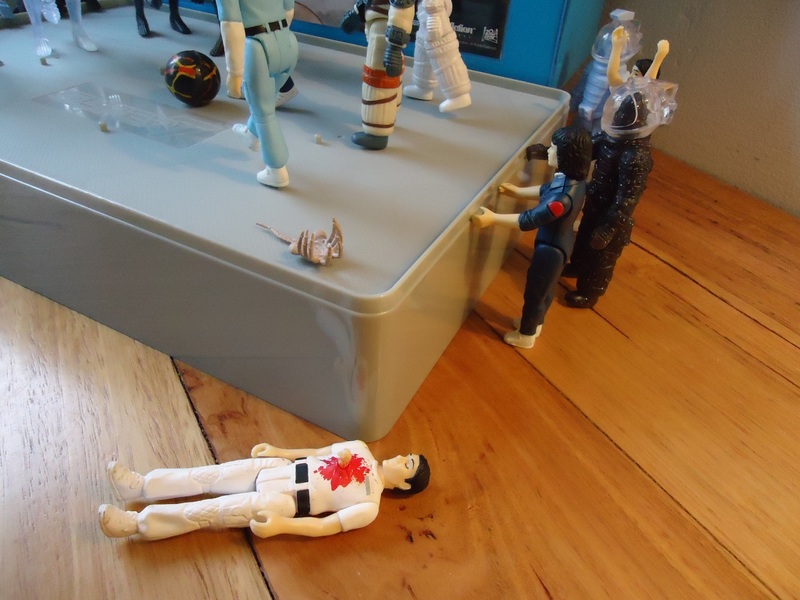 2013 – Series 1: Alien, Kane in compression suit, Dallas, Ripley in Nostromo crew gear, Ash, Alien (Grey translucent.)*. 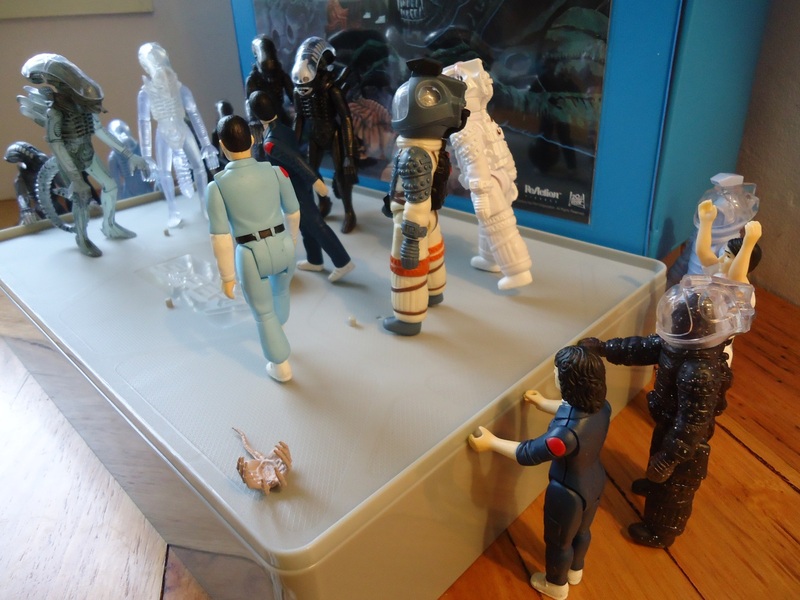 2014 – Series 2: Metallic Flesh Alien, Kane with facehugger, Kane with chestburster, Ripley in compression suit. 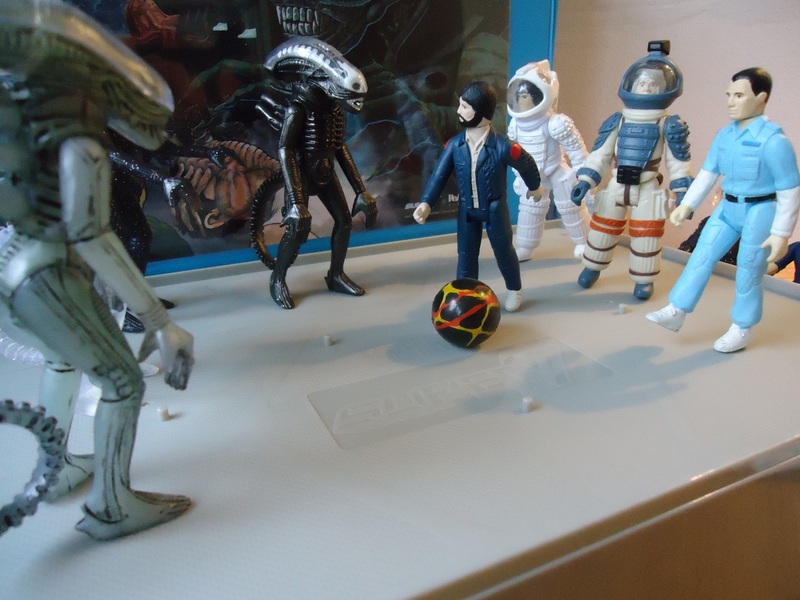 2014 – SDCC ‘Deep Space Mystery Egg’ Blind Box: Alien, Kane with chestburster, Ripley in compression suit, Ripley in Nostromo crew gear. 2 variants of each: dark translucent with silver flecks (aka ‘Midnight Star’) and clear translucent. 2015 – Nostromo crew in compression suits, 3 pack: Kane**, Lambert, Dallas. 2016 – Carry case inclusion: Alien (Glow in the dark.). 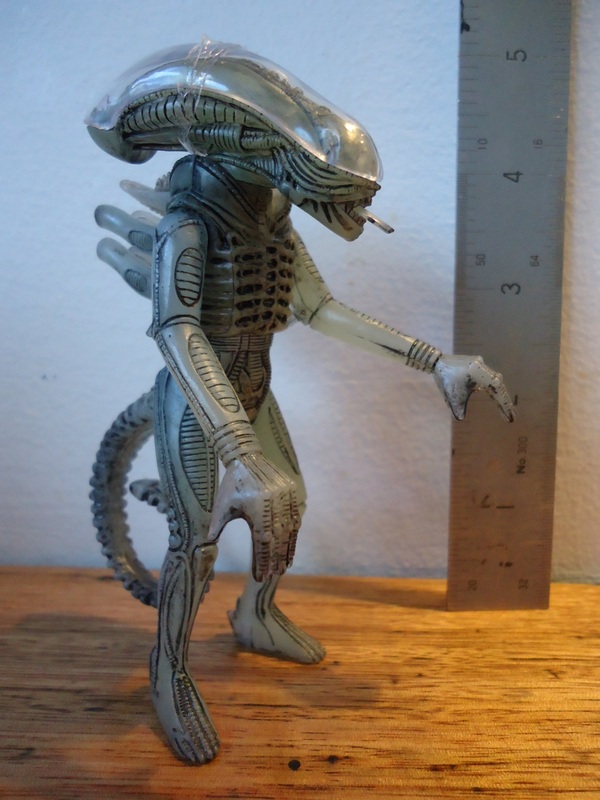 *The grey translucent Alien was SDCC 2013 Pre-order exclusive only. **Kane in compression suit variant is different colours to original pressing. Lambert and Dallas are derivations of Kane in compression suit figure. Great review! Gonna pick mine up from the post office today. A note to fellow Canadians: the Super7 store wanted to charge me $50(!) USD shipping on this. I cancelled my order and went with Big Bad Toy Store, who only charged me $20, and it got to Toronto in about a week.